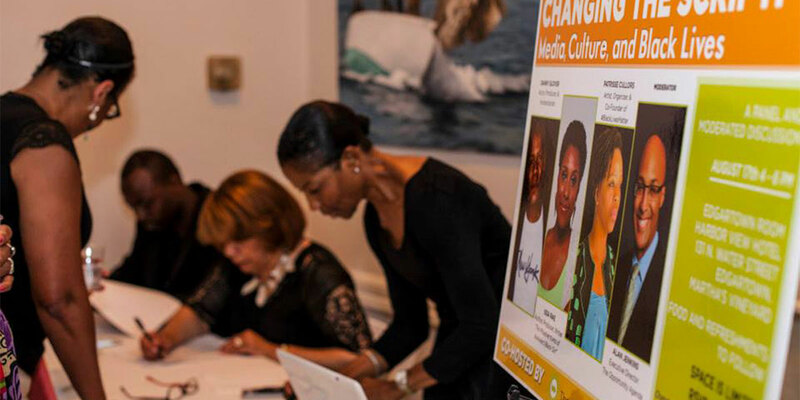 The Opportunity Agenda hosts a variety of in-person and online events that are open to the public. These events include webinars and in-person trainings on our tools, research, and advice, Twitter chats focused on current events, and panels that bring together leading voices to chart a path forward on difficult issues. Through our public programs, we shape public discourse on key issues, as well as strengthen the capacity of social justice advocates to forward their vision and values. An ongoing series of webinars focused on Social Justice communications and research. Panel discussions on Martha’s Vineyard that have brought together leading voices to discuss racial justice issues. Participants have included Danny Glover, Patrisse Cullors, Issa Rae, Tanya Coke, Rashad Robinson, Phillip Goff, and Dawn Porter. Interactive Twitter chats on topics such as The Road Ahead for Social Justice and The Criminalization of Poverty. Our staff (and our superhero, Helvetika Bold!) lead conversations and train participants at a range of conferences and convenings – from Netroots Nation to Comic Con. We celebrated the them Future Over Fear and honored comedian and CNN United Shades of America host W. Kamau Bell, Astrid Dominguez of the ACLU Border Rights Center, and Lola C. West of WestFuller Advisers, LLC. Zahra Noorbakhsh joined us again as emcee and The Flobots helped entertained the lively crowd. Black Panther is more than a movie, it is a movement. Our panelists, Bridgit Antoinette Evans, Baratunde Thurston, and Charles Pulliam were led in a discussion moderated by our own Jamila Brown about Black Panther's impact on social justice. We celebrated the theme Rise Above and honored legendary actor George Takei (oh my! ), Keith Mestrich, Celinda Lake and MacArthur Genius Grant awardee Cristina Jimenez. Zahra Noorbakhsh was our incomparable emcee and Las Cafeteras played incredible tunes for 200 of our closest friends. Americans’ ideas about poverty are complex, and set the terms of what we can do to address it. This webinar, led by Lucy Odigie-Turley, Sheri Brady, and Julie Fisher-Rowe, shared highlights of our research on how Americans think, feel, and talk about poverty. The American criminal justice system saps individuals and communities of opportunity. This webinar, led by Loren Seigel, I. India Thusi, and Julie Fisher-Rowe, focused on our real solutions to reform nearly every element of the criminal justice system. Americans are finally(!) talking about race, but it’s up to all of us to ensure we have honest conversations that uphold our values. Julie Fisher-Rowe, Daryl Atkinson, and Tia Oso shared practical tips for making that happen. There’s a reason why Martin Luther King Jr. never said, “I have a complaint.” Shared values are a powerful communication tool, especially for reaching across lines of conflict, and this webinar, led by Silky Shah, Jon Rodney, and Julie Fisher-Rowe, discussed how to use them. In the age of “fake news,” it is critical to distinguish between fact and myth. But, research shows the “myth-busting” only reinforces the original myth. This presentation, shared here, included advice from Julie Fisher-Rowe, Nicole Pittman, Jesse Van Tol, and Soffiyah Elijah on navigating this critical communications challenge. Happy 10 year anniversary to us! We honored Linda Sarsour and Susan Butler Plum, heard from D'Lo and Toshi Reagon, and partied with 200 of our closest friends. This panel on Martha’s Vineyard had a blockbuster lineup--Danny Glover, Patrisse Cullors, Issa Rae, and Alan Jenkins--and discussed how culture makers and activists can use media and creative strategies to tell authentic stories about Black lives. Together with Lorraine Toussaint, Phillip Agnew, Daniel L. Greenberg, D'Lo, and Negin Farsad, we celebrated another year of spreading opportunity for all. This meeting brought together artists, activists, and funders from across the South to develop strategies for using the 10th Anniversary of Hurricane Katrina to refocus attention on inequality. At this meeting, The Opportunity Agenda convened advocates, artists, and funders to develop a core narrative for communicating how we can and why we must shift policy on criminal justice.